Also, we saw several stands of "mote con huesillo" (picture). Wikipedia: 'refreshing drink, without alcohol, based of wheat cooked and dried peach'. We did not really liked. Not hated but not liked either. Hourra the coca-cola. Essence 1.50$/litre, donc un peu plus cher. 5$ un petit pot de beurre d'arachides, donc beaucoup plus dispendieux. Un repas tout à fait ordinaire : un service + café + coke : 30$ . Pourraient se comparer à nos restaurants du Québec. 6,50$ un petit steak d'entre côte (sans os) chez le boucher. Semblable que dans nos épiceries. - Gasoline 1.50 $ / litre, therefore a little most expensive then Quebec. - 5 $ one jar of butter of peanuts, much more expensive. - One simple meal : one service + coffee + coke: 30 $. About what you expect in our restaurants of Quebec. - 6,50 $ for one small steak (without bone) at the butcher. - 9 $ / 2 passages of bus for 2 hours of road, that is not expensive ! Ne vous méprenez, le chien adorait être brossé. Deux mots qui vont très bien ensemble. Je devrais cependant en ajouter 2 autres... au pluriel... ABOIEMENTS INCESSANTS . Ca y est, j'ai tout dit, et vous avez tout compris. Notez que ces mêmes chiens sont très tranquilles dans le jour. Pas agressifs pour une miette. Normal, ils dorment pour récupérer. Dogs and night... two words who go very well together. I should however add 2 others ... in plural ... barking and nonstop. With that, I said everything. Note that these same dogs are very quiet in the day. Not aggressive for one crumb. Normal, they sleep for recover. À Villarica, il a fait froid. Quand on doit chauffer le poêle à bois le jour et la nuit, c'est parce qu'il fait frette, ou qu'on est frileux... Ou leurs deux. Heureusement, les jours étaient généralement plus doux, pour ne pas dire plus chauds. Mais fallait rester sous le soleil (cuisant). Notez que les maisons ne sont pas isolées comme les nôtres. Et certaines prennent passablement l'air. Quelque chose d'impossible au Québec ! Et les chambres d'hôtel qu'on a pris avaient un système de chauffage d'appoint. Fiou ! Temperature to Villarica was cold. When you must heat the woodstove almost day and night, that is because it is cold or we are overcautious ... or their two. Fortunately, the days were generally warmer. But had to stay under the sun. Note the houses are not isolated as ours. And some take quite the air. Something impossible at Quebec! And the rooms in hotel had heating system. Fiou! The weather at edge of the sea was very nice by day. Hot but not too hot. But we also had very often fog, which stays until after dinner. The city appears then a bit ugly and gray. It is nothing when you are in holidays. En un mot, super bien organisés ! Et confortables. Le bus "salon cama" de Chiloe à Santiago a pris 18 heures, mais on était dans des fauteuils similaires à des lazy-boys. La nuit s'est passé plus agréablement. Bus and system road... super well organized! and comfortable. The bus "salon cama" from Chiloe to Santiago took 18 hours, but we were in of seats similar to a lazy-boys. The night pasts more pleasantly. Le peu qu'on a vu ne nous a pas impressionné. Beaucoup de plages (de lacs) sont composées de sable volcanique, donc noir. Les plages de sable blanc de Viña del mar cependant (en bordure de mer), étaient très inspirantes. Les longues plages étaient belles et agréables, mais ça n'a rien à voir avec ce que vous êtes habitués. On n'y rencontre pas nécessairement les infrastructures des grands hôtels (genre il n'y a aucune chaises transats à nulle part). Traînez votre matelas de plage ! Beaches the little we saw did not impressed us. Much beaches (of lakes) are composed of sand volcanic, therefore black. Beaches of white sand in Viña del mar however (in border of sea), were very inspiring. The long beaches were beautiful and pleasant, but has nothing to see with what you are accustomed. You will never see any infrastructure of great hotels of the tropics (no chairs transats nowhere). Make sure you have your own mattress for the beach! Tellement gracieux et photogéniques. Joe de Villarica disait qu'un sommet de volcan qui perd sa neige se compare à une vieille femme nue. Ça existe, mais on ne veut pas voir ça. Ça m'a fait sourire. Summits snowy so graceful and photogenics. 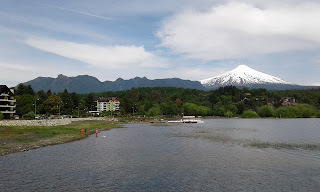 Joe of Villarica said that a summit of volcano who loses its snow is compared to a old lady naked. That exists, but you don't want not see it. I smiled. Ici il n'existe pas ou peu, de systèmes de récupération et recyclage, du moins là où on est allés. Par contre, partout c'est propre. Les gens ont à cœur de garder leurs lieux propres et exempts de détritus. Et des équipes de travailleurs font aussi du beau travail. Bravo, c'est réussi. Recycling here don't exist or little, nor systems of recovery or composting, at least where we were. On the other hand, everywhere it is clean. The people have to the heart of keeping their places clean and free of detritus. Also, lot of workers make of beautiful work. Bravo, that is successful. Totalement et parfaitement. On a toujours bu depuis les robinets sans aucun souci. Super, ça évite d'acheter de l'eau en bouteille (ce que je ne fais que si je suis obligée car c'est contre mes principes, contre ma religion). Drinking water from the tap was totally and perfectly. We always drunk from the taps without no concern. Great, that avoids of buying water in bottle (what I do only if I have to. It is against my principles). Viña del mar, Valdivia, Puerto Montt - la plage, le marché aux poissons, les gens. Our blows of heart was Viña del mar, Valdivia, Puerto Montt - for the beach, the market to fish, the people ! On y reviendrait. Pour visiter le nord du Chili, et si on n'était pas frileux, la Patagonie. N'hésitez pas, le Chili est un très beau pays ! So, this is it ! We might come back in Chile, specially seeing the north, and if we were not overcautious with the cold, we would love Patagonia. Never hesitate, Chile is a beautiful country !